Start your private tour with a pickup from your central Madrid hotel and travel southwest to Toledo – an ancient UNESCO-listed city that is often considered as the spiritual capital of Spain. How you get there, how you see it and how long you spend there is up to you; choose from five different options, either seeing the sights with a guide (as detailed below) or simply making use of your private driver to see Toledo at your own pace. All entrance fees and meals are at your own expense. 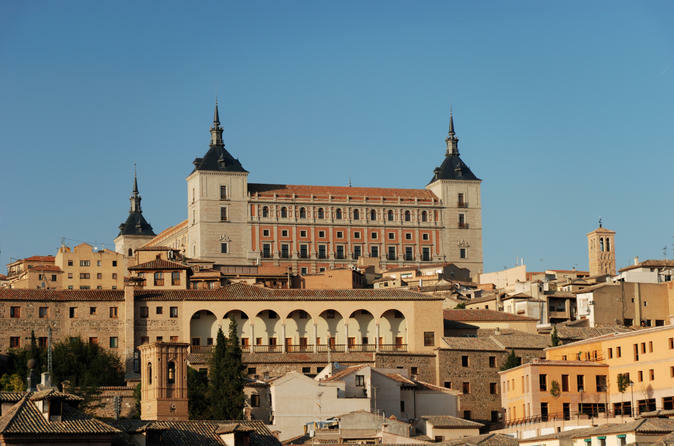 Head to Toledo by air-conditioned minibus or minivan, and as you travel, your guide will chat to you about the ancient city and its countless attractions. The journey takes roughly an hour, leaving you with a good three hours in town to see the city highlights. Many attractions are clustered around the Old Town, so head there first to see Catedral de Toledo – a Mujedar and Renaissance building that represents the heart of Catholic Spain. Stop for pictures outside and learn of its impressive 13th-century history. Continue to Sinagoga del Tránsito – a synagogue that was built at a time when Jewish houses of worship were banned in Christian Spain – and hear tales of the different religions that left their mark on the city. After stopping for lunch, visit Museo del Greco to see the home of Spanish Renaissance artist El Greco, admiring artifacts that once inspired the painter, and then perhaps visit Museo Sefardi to see a collection of traditional costumes worn by Toledo’s Sephardic Jews. Finish with a stroll around the old Jewish quarter before returning to Madrid. Visit Toledo by minibus or minivan, enjoying roughly five hours in the city for a more in-depth look at its highlights. Spend longer at each of the sites included in the 5-hour itinerary, or choose to see more sites instead! Pay a visit to Mezquita de Cristo de la Luz, a glorious 10th-centuy mosque that was later converted to a church, or perhaps check out the Alcázar – Toldeo’s medieval fortress that looms over the city. Get your camera ready to capture photo-snapping views! Travel from Madrid Atocha Station to Toledo by high speed train . Cutting the journey time by half an hour, this option enables you to spend the most time in Toledo itself. Explore the city by foot and spend longer at each of the sites, enjoying lengthier explanations of the key attractions from your guide. Alternatively, take a more leisurely lunch break -- just as the locals do! Please note: Guide will be available for 3 or 5 hours.